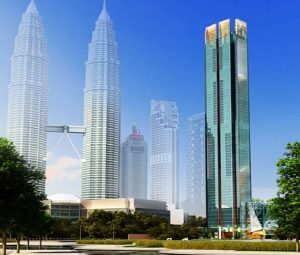 After lunch, the group headed back to Kuala Lumpur’s bustling City Center in order to check out the construction site for the Four Seasons Place. This project is a mixed use facility, which will include retail in the lower levels, a hotel in the middle, and some very high-grade condominiums in the upper levels. It is being constructed by the Chinese Railroad Construction Company (CRCC) and is managed by Turner International. 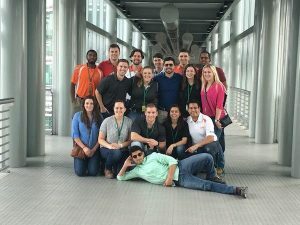 We were welcomed by Project Director David Reaves, Construction Manager Andrew DeFonzo, and Preconstruction Manager Matt Hennessy (who is focusing on the KL118 project that we’ll be visiting on Friday) from Turner International, who gave us some insight on Turner’s role within the project. Turner International, which began in 1965, primarily functions as a Project Management Consultant (PMC), which acts as the owner’s representative on site, while supporting the general contractor (in this case CRCC) to help the project finish in a timely and cost-effective manner. David went into some details on how him and Andrew have been able to draw from their almost fifty years of construction experience in order to help save the owner money. One example of this is introducing BIM, a technology that is now common in other parts of the world, but was not familiar to the contractor. By facilitating the use of this, they were not only able to save the client more money, but they imparted a very valuable skill to the contractor for future use. 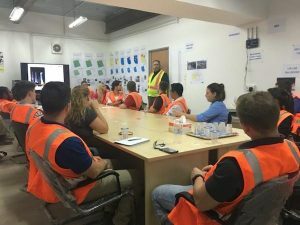 More importantly, they’ve worked to make sure all of the laborers on site are prioritizing safety at all times, which is an issue in this part of the world. David and Andrew both mentioned some unique challenges specific to working in Malaysia versus working in the States, such as the ability to demonstrate strong patience when managing laborers with much different skill levels than those typical in the US, as well as learning how to most effectively motivate these workers to complete the task at hand. All of this requires a level of sensitivity in regards to cultural and religious customs, as well as an understanding that some things will be lost in translation when communicating to a largely non-English speaking workforce. 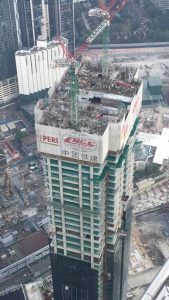 After gaining some insight on Turner International’s role and hearing about some of their past PMC successes (Burj Khalifa, CCTV Headquarters, Taipei 101 – the list goes on), we followed David and Andrew to check out the rest of the job site. 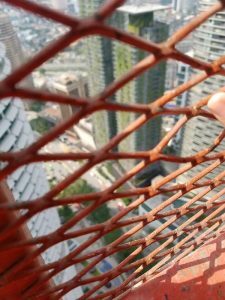 The team hopped onto the skip joist (would not recommend to anyone else afraid of heights, although I did ultimately survive) and headed to the 50th level of the building, which will have over 75 levels when it’s completed. From up there we had some spectacular views of the neighboring Petronas Towers, which we were set to visit next. We moved down a few levels to see the hotel area, and we even had a chance to check out a finished room, which has been constructed so that the Four Seasons can be sure that all the correct interior finishes are being used (it looked pretty good to us!). We then checked out the retail levels, which are sandwiched by parking garages. 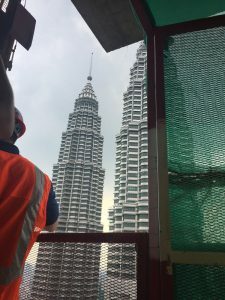 After this, we said our goodbyes to David and Andrew, put the hardhats and safety vests aside, and headed over to the Petronas Twin Towers. 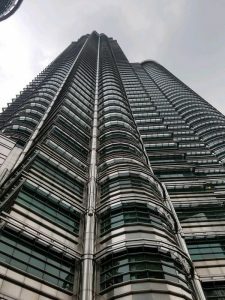 The Petronas Towers (we learned the emphasis is on the P, not the O) have been drawing attention to Kuala Lumpur since their completion in 1998. Designed by U of I alum Cesar Pelli, these towers still look brand new, thanks to the ingenious use of stainless steel for the facade. The towers literally shine during the day, and are lit up just as brightly at night. Standing at a little over 1450 feet, these towers were the tallest in the world until 2004. They are designed in the shape of eight-pointed stars, a popular Muslim motif (Malaysia has a large muslim population). The buildings are probably most recognized for the skybridge connecting the two buildings. We were not about to miss the chance to check it out! After our long and exciting day, we were happy to get some food and head back to the hotel to rest. Another early start in the morning!